Life/form® Basic Buddy Convenience Pack. 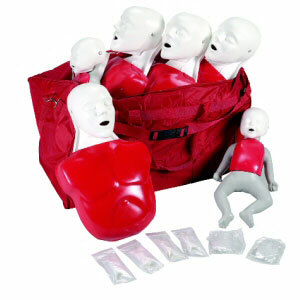 Includes four (4) Basic Buddies, two (2) Baby Buddies, six (6) Lung Installation Tools, forty (40) Basic Buddy lung/mouth protection bags, twenty (20) Baby Buddy lung/mouth protection bags, and a carry bag. Five-year warranty. Not made with natural rubber latex. Conforms with ISO 9001 and ISO 13485. They look so professional, just like they do in the picture. Requires a little assembly, but worth it for the price. I researched for hours to find the best price and product and this is it!